NARAYANA Vokalliga from Belur village in Kasaragod breathed his last on November 20 just as his son was explaining how his father had suffered from exposure to endosulfan for 30 years. The former employee of the Plantation Corporation of Kerala used to spray the toxic pesticide manually in the corporation’s cashew plantations at Nanjamparamba estate. When the corporation switched to aerial spraying, Narayan prepared formulations by manually mixing endosulfan with water to be used by helicopters. He had always suffered from body pain and headache, but his health has undergone rapid decline in the past 15 years. Narayana’s death belies the corporation’s claim that workers at the plantation never suffered from endosulfanrelated illnesses. During a study in 2001 the corporation officials said there were no health problems among workers, said A Achyuthan who headed the study panel set up by the state government to estimate the impact of two decades of endosulfan spraying in Kasaragod. The corporation continues to tow the same line even today. In an affidavit prepared to be filed in the Kerala High Court in early December, the public sector company disowned responsibility to pay compensation to endosulfan victims in Kasaragod. The affidavit was in response to a petition by T Asif Ali, president of Indian Lawyers’ Congress, demanding a tribunal to decide compensation for endosulfan victims. In the affidavit the corporation maintained they had not used an illegal pesticide because endosulfan was registered under Insecticides Act, 1968 and the corporation was working on the advice of research centres and agriculture universities that cited endosulfan as the only solution for tea mosquitoes, a cashew nut pest. The stand of the corporation did not go down well with Chief Minister V S Achuthanandan who is on a crusade against endosulfan. His government asked the corporation to withdraw the affidavit and the managing director, N K Manoj, to step down. The Additional Advocate General is drafting a fresh affidavit for the corporation, owning up responsibilities for endosulfan victims. Meanwhile, chairperson of the National Human Rights Commission, K G Balakrishnan, visited Kasaragod on December 18 and compared the situation with that of the Bhopal gas tragedy. He has recommended a super speciality hospital for those who have been affected by endosulfan. Kerala Pradesh Congress Committee submitted a memorandum to the prime minister at the Congress Plenary session in Delhi on December 21, demanding compensation of Rs 2 lakh for the families of the deceased victims of endosulfan and Rs 1 lakh for those suffering from endosulfan-related illnesses. A survey done by the state government in October shows 2,210 people from 11 gram panchayats in Kasaragod are affected by endosulfan. The muted figure did not go down well with activists fighting for endosulfan victims as the survey was done in three-four days and covered only a part of the district. The government has now extended the survey by roping in anganwadi workers. “The surveys are still incomplete and unacceptable,” said Shree Padre, member of Endosulfan Spray Protest Action Committee. The surveyors are not trained to identify pesticide victims. Many do not even understand the local language and the questionnaire they used is flawed, Padre said. Sticking to the survey report would mean deserving victims would go without aid, he added. Of late, reports of endosulfan-related illnesses have started pouring in from villages far away from the area where the pesticide was sprayed. For instance, cases of endosulfan-related illnesses are reported from Panaje village in Karnataka, adjacent to Kasaragod, where endosulfan was never sprayed. This could be because the pesticide can drift by wind kilometres away from the spray area, Padre added. A hamlet in Adoor village in Kasaragod also reported cases of endosulfan victims 10 years after the spraying was stopped. The village is close to the corporation’s Nanjamparamba estate. Residents claim the corporation dumped endosulfan on a nearby hill after Kerala banned aerial spraying of the pesticide in December 2000. Streams flowing from the hill are the source of water for several villages in the valley, including Adoor. Several victims feel the survey is unfair as it takes into account only mental retardation, physical deformities and cancer. Manikantan and his brother Sujith of Bovikanam village, for instance, suffer from psoriasis, a disease that leads to thickening of skin. Their parents did not work in the cashew plantation but their grandmother did. She used to prepare endosulfan mixture for spraying and died of uterus cancer. The surveyors rejected the brothers from the beneficiary list saying they are not physically disabled. Sujith’s brother and father who work as labourers can no longer afford the treatment costs. There are also increased cases of menstrual irregularities, abortion and men suffering from low sperm counts. But the survey does not consider them victims, said Jayalakshmi Bhat, panchayat head of Karadka. “A survey by the district medical officer in 2009 identified 52 people in my panchayat suffering from endosulfan illnesses. I suspect over 260 are affected,” Bhat added. Then there are victims like twoyear- old Saariya who are listed as beneficiaries but the compensation amount is too meagre to offer them comfort. 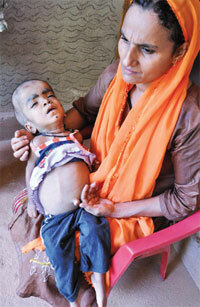 Saariya suffers from hydrocephalus, a condition caused by accumulation of water in brain. She requires at least eight visits to doctor every month, each visit costing Rs 500. 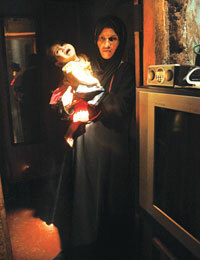 Recently she underwent two surgeries, which cost her father, Abdul Rehman working in the Middle East, about Rs 8 lakh. Saariya should receive Rs 1,000 a month as compensation but she received Rs 2,050 after a gap of three months. Rehman had to take loan from private lenders for her treatment. The chief minister has announced waiver of loans for affected families. It is applicable for bank loans. Families like that of Saariya say it is difficult to get loans from banks, so most get loans from private lenders at high interest rates and the government’s announcement hardly offers any relief. The prime minister has, meanwhile, asked Union agriculture minister Sharad Pawar to form a committee to investigate the impacts of endosulfan. The committee, headed by a health expert, would replace individual committees under agriculture, health and environment ministries. Why is it that only Kerala is affected by Endosulfan. Why are there no victims reported in Punjab, Maharashtra, Andhra Pradesh, Gujarat or any other state in India? Can it be assumed that all the six government committees that prepared reports defending Endosulfan are corrupt? These images are revolting indeed. However, they do not include pictures of farmers that will be driven to suicide when they will be forced to buy EU's patented Endosulfan alternatives that are atleast 10 times costlier. Why has the media not considered this aspect yet?? Why is it only kerala and Karnataka states affected by Endosulfan is your question. Interesting. Because of large scale spraying of endosulfan on Cashew nut gardens which found only in Kerala and part of Karnataka states. 4. White fly ( Aleurolobus barodensis). I think the effects of using endosulphan need to be studied seriously in the sugarcane belt of Uttar pradesh also. well the impact is severe in Kasaragod in kerala and Dakshin Kanada in karnataka because of aerial spraying of endosulfan over state owned cashew plantations- wherein helicopters carrying the pesticide in a tank flew over plantations to spray over cashew nut areas- the impact of such aerial spray will be huge because of its spread to larger areas, water bodies, schools etc. It is bewildering to see the alacrity with which the pesticide lobby jumps at any comments on the devastating effect of Endosulfan. And they are masterly when it comes to obfuscation and deceit. The recent one, weird in every sense but dished out nonchalantly by the lobby, is that the region is peculiar for consanguine marriages and hence the genetic deformities! There is no shred of truth in the surmise - but that is no deterrence if your only aim is to mislead. In the annuls of global action against toxic chemicals the Kasargod endosulfan saga is going to find its place not so much for the tragedy and suffering or even the popular resistance that has built up in Kerala against the deadly chemical. Instead, the efficacy of the pesticide lobby to so tellingly marshal patriotism, patent democracy and farmers rights to defend the completely indefensible and raise a wall of falsehood even in the face of shocking irrefutable evidence will be discussed and analysed years later. How could they? we would then exclaim in shame. The adverse health effects of Endosulfan are prominent in Kerala and Karnataka only because Arial spraying of endosulfan was done only in these states and it polluted the water bodies including ground water table. Andhra Pradesh was one of the states which switched to non chemical alternatives to endosulfan much earlier and is successful. Punjab,Maharashtra,Gujarat do not grow cashew nuts plantation unlike Kerala or Karnataka, which demands Arial spraying.More than 80 countries including the EU has banned it and was recently discussed in the Stockholm convention for a global ban and the only country which opposed the ban was India.